Throughout this year, I've been playing with decorative pillows. 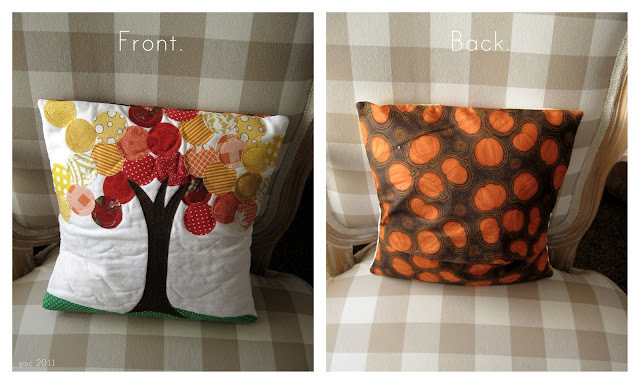 I started with a small pillow form (11" square), and have had so much fun making pillow covers to switch out with the seasons and holidays. It's just the right size to add something new without being overwhelming. You can see the other pillow covers for Valentine's, Spring, Summer, and Independence Day, too. Each one I've tried a new technique. Fall is no exception. I was inspired by Allison @ Cluck, Cluck, Sew's fun pillow she blogged HERE. It's been on my to do list for a while. I have a thing for circles, so I opted for circle leaves. I cut out a lot of circles which I'd previously adhered to some heat n bond light. I also free-hand drew the trunk shape on to some brown fabric. I thought the bottom of the pillow needed some color, so I added some green rolling hills under the trunk. As I got going, I found some of my circles coming off! Rats. So, I added some additional stitching. I've also changed out the little banner in my wreath and put up my fall-themed one. Remember, it was the start of all my fun mini banners? I LOVE the fall. The air is crisp in the mornings, the afternoon temperature pleasant, and the evening light is so golden and soft. Hooray for September! p.s. I've finally started to prepare to stock my etsy shop with more than just patterns. There might even be some mini pennant banners! Sharing with Kojo Designs, Creation Corner, Tatertots and Jello, Be Different, Act Normal, Sew Many Ways, Fall Point of View at Gwenny Penny, and Someday Crafts Fall Linky. Featured at Creation Corner, Oopsey Daisey, and Someday Crafts! your pillow is so pretty Chris! Circles are just about my favourite shape too so I'm loving your foliage! Congrats about putting "things" in your Etsy shop. I hear diversifying is the way to go. I love the fall colors and the simple shapes!!! I love the pillow, Chris. I think the stitching looks great, especially on the trunk. I tried free-motion quilting once and quickly stopped. It was a complete failure. I think your first try looks fantastic. Yet another great and adorable idea. Love the colors in your circles! Can't wait to see the Christmas one!! So beautiful! I loved your preview and absolutely love the final pillow. It really is an heirloom that your kids will be fighting over. @ksolo59You know, I hadn't considered making a Christmas one because I already have some darling ones my mom made long ago. Perhaps I need to make my own! Something with a banner??? I love that tree! You've inspired me to use my free-motion foot again. I love this! I'm definitely pinning to try this myself. I love this, I Pinned this I hoep you com elink this up to scrappy saturdays tomorrow, it's the perfect project! Love the colours! I <3 fall projects! Very cute.I really need to start making pillows myself. I am loving this pattern. This turned out so cute! I have had about 4 pillow forms stuffed under my futon for a couple years - I really need to do something with them! I might give this a try! Thanks for sharing! I hopped on over from TT&J's Link Party, and I LOVE this pillow idea! I definitely want to try this out--maybe make one for Fall and one for Summer. This is so much fun! Thanks for sharing! I don't know a thing about quilting, but I think the stitching looks fabulous! I'm a sucker for anything with a tree, and the green on the bottom really brightens it up. Beautiful! Cute pillows! My mom did a pieced fall table runner on our blog this week that I'm thinking about doing to introduce some seasonal decor into our home. This pillow is fabulous, thank you for the inspiration! That is one beautiful pillow! YOu did a great job. I amf eaturing it at somedaycrafts.blogspot.com. I adore this pillow- and you know I love me a good pillow. ;) I will be featuring it this week. I love all your pillows, but this tree is my favorite! Thanks for sharing. Thank you for the inspiration... I made my own version of this happy Tree pillow.. We are having a Shape Challenge in my Guild, and your Happy Tree inspired me to make my own. THANK YOU! I'll definitely send credit for inspiration your way!! Hugs and Happy Quilting!